﻿ Orientation : talismans, amulets, magick, rituals, empowerments, spells, powers, charms, etc. This is the main page of this site and contains our introduction. You will find the disclaimer (also terms of sale) herein. Our monthly bonus special appears on this particular page and is updated early each month. A downloadable catalog may be accessed here. The price list may be requested from us. Here you will find countless magickal items of interest--items for protection, health, love, romance, power, psychic development, wealth, prosperity, etc. 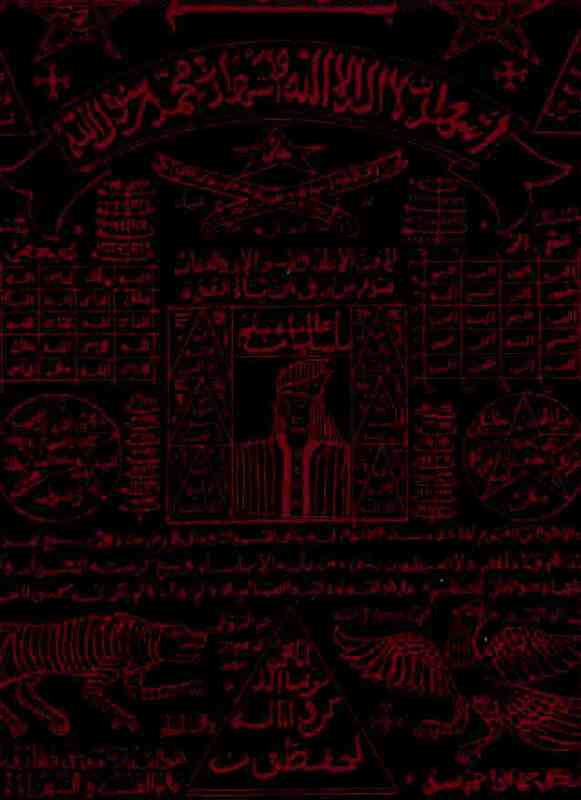 These are all empowered/consecrated and produced by adepts of the Islamic al-Himah tradition and the practitioners of Javanese mysticism/occultism, or "Kejawen" as it is called. There are currently three pages represented by the three button links (Magickal Items#) of the graphical menu. Instructions accompany all magickal items of this section. In the various pages of the products offered in this site we sometimes have buttons such as "Hot" or "Cool" besides an item. "Hot" simply means that an item is popular and many clients have purchased it. The "Cool" button is our opinion of a value of a product; should it sell well, we replace the "Cool" button with "Hot." All descriptions of the magickal items are as given by the adept-producers--not by Indotalisman. The above link will take you to the first page of the magickal items. Various types of incenses are offered in this section. Most are especially good for conjuration or ritualistic purposes. Many kinds of oils/perfumes are offered here--these are appropriate for ritualistic or magickal work. The talismans/amulets in this section are unempowered or semi-empowered. They are offered for consecration and empowerment by the practitioner for any purpose that he or she has in mind. If you seek prepared, empowered items, do visit the Magickal section instead. Unlike the items of the latter section, there are no instructions accompanying the talismans/amulets. You will find in this section various talismanic cloths, vests, handkerchiefs, etc. These are all unconsecrated items, but designed like the talismans/amulets to be receptive to the force of the empowerment. No instructions accompany these products. This section deals with talismanic accessories: rings, pendants, and bracelets. These, however, are void of any psychic force. They are of worth to occult practitioners who know how to empower these things. They may be worn as regular bodily ornaments. Assorted items of occult value are added into this section. You will also find tasbihs (rosaries), talismanic medallions, and miniature kerises here. This section may be updated occasionally with new additions. These pages contains pictures of the products within the sections of the main navigation menu (button-menu) excluding the "Magickal Items" pages. Ideally, you would visit the sections of the main menu such as the "Talismans and Amulets" section, read the descriptions of the products and click the titles of the items to be led to their associated pictures linked to the photograph pages. If you visit the pages containing the photographs you will have to note the code number of the product that interests you and then visit the relevant page in the main button menu to find its description. The codes are self-explanatory and it would be easy to find the right section. The link above takes you to the first page containing photographs. In this section you may download the catalog of most of the products offered at our website. The catalog is constantly being updated with new stuffs, or items removed should they be discontinued. Ebooks are also downloadable from this section. For more information regarding the ebooks please visit Ebooks. Other downloadable stuffs may be added in this "Downloads" section as the site progresses. Here you will find many articles, papers, and essays that we have written. Quite a few titles are not yet ready for posting, thus they are not linked to any pages as yet. Articles from other writers are also included in this section. We accept submissions, so if you have any interesting article of a metaphysical, parapsychological, occult or magickal nature that you would like to share with our visitors, you may do so. Please note that we will not accept works of an offensive or negative nature; or papers that are poorly written. We reserve the right to edit or proofread submissions as required. Free talismanic figures and mystical diagrams are offered in the pages of this section. They would function best if empowered with the appropriate force generated by the correct rituals, prayers, and mantras; though we do often get feedback from people having success with them as they are--you just have to save them to your computer, print them out, and place them in your wallet, purse, or displayed somewhere in your home where you can see them everyday. The talismans are samples of many others to be found in the knowledge-papers within our Ebook section. The link above takes you to the first page of the graphical talismans. Here we present links to many interesting sites. Most are link partners, but quite a few are our favourites. Please note that though many site links are present in our pages they do not necessary imply that we concur or support the sites themselves, whether it be the products they sell or the perspectives presented in their articles. The point is that variety is being presented, and it is an excellent idea to explore the many avenues of information to broaden one's mental horizon. In the link pages are also button/text links of top sites. Do click on them to give us your vote--right-click on them and open to a new page so you do not lose our site. If you do, after placing your vote, return to our site by clicking on the "back" button of your browser. If you are interested in having your site link in our pages, you may submit it to us with your site info; we do require a reciprocal link in return. Sites dealing with the occult, magick, spirituality, etc., are preferred. Commercial sites are welcomed. Clicking on the link above takes you to the first "Links" page. In this section we present items that would interest collectors; they may or may not be occult-related and can be anything at all. Here is where we present the kerises (Indonesian athames, daggers) in our collection. These are all for sale--contact us if you are interested in them. This section is void of text but we hope to make up for this in articles or papers on the subject. After viewing our site many visitors have contacted us to make some inquiries. The questions most often asked are posted in this section as they provide general info and are deemed of interest to visitors. We have also added some anticipated questions and have answered them here. Just clicking on the question leads you to the answer. All of our latest additions to the "Magickal Items" section are listed here; thus, this page is often updated. New additions to the other sections are likewise mentioned herein. If you are a regular visitor you might want to first check out this section to see if anything new has been added. Several spells, conjurations and rituals of power of the al-Hikmah and Indonesian shamanic tradition may be found in this section--these are given freely. They are samples of what you would find in the knowledge-papers offered in the Ebooks section. The above link takes you to the first page of the rituals. We offer ebooks of metaphysical, occult, and magickal interest in this section. There are several pages describing knowledge-papers. Samples of what they might contain can be found in the Rituals and Free Talismans sections. The link above takes you to the first page. In this section we present scarce and rare pearls derived from animals, plants and the environmental conditions of Nature. You will discover that not only oysters produce pearls but other creatures as well. What makes them unique is that they possess elemental intelligences embodied within them and they likewise emanate magickal power. In Indonesia, these pearls are called "Mustika." Naturalists call these pearls "bezoar stones," and believe that they are produced in the stomachs of animals--some do indeed; however, they are also produced in other organs or other parts of their bodies. These valuable pearls are offered for sale. The link above takes you to the first page of our selection. We have gathered most of our magickal products related to commandable genies and "khodams" in this section. Please note that we do not offer genies that do sensational stuffs such as teleporting oneself to another location, changing one's form, manifesting treasures before one's feet, or surround oneself with a harem of women. The genies offered, work through regular channels to help you solve the problems of life or help you build the natural powers within you. All sorts of spiritual empowerments done remotely by us may be found here. We offer these to assist the regeneration, healing and spiritual quickening of one's life. This section is devoted to items produced by the indigenous tribes and ethnic groups of Indonesia--items representing their culture. Like most of the other sections, this page will be updated often with interesting stuffs. Woods regarded sacred and possessing magickal power are offered here. These could be in the form of pendant pieces, kerises or other objects. Metallic blades and objects considered sacred because of magickal power conferred upon them or because of their long use in mystical rituals, are to be found in this section. Should you wish to place an order this is the page to visit for payment instructions and details. We offer several payment methods, however, because of certain matters which we need not disclose, we are unable to accept paypal, credit cards, checks or money orders. The title of this section says it all. Silver talismans, objects and jewelry may be found in this section. These are unempowered/unconsecrated items. Quite a few clients using the magickal products that we distribute sometimes send us positive feed-back and allow us to use their comments and statements as testimonials. This section contains their unsolicited testimonials and evaluation of products used or services rendered by us. Many visitors are interested in Javanese culture, mysticism, philosophy, occultism and magick. This section is devoted to course papers on the subject. Study papers on topics of Islamic occultism, the traditional shamanism of Indonesia and metaphysical, esoteric, magickal, or occult teachings will also be presented here. We are members of various webrings--this section presents them. All sorts of Indonesian handicrafts are presented in this section. These are non-magickal items. The scroll menu of the selections is only found in the main page of the Catalog and the associated pages of the selections. They contain select magickal items arranged in categories: Protection; Martial-arts; Love & Attraction; Prosperity/Luck/Money, etc. Visit the Magickal Items pages for a more complete viewing of these products. Awards we received from many webmasters/mistresses may be seen in this section. This section is devoted to antiques that are not related to magick or to the occult. CDs, VCDs, DVDs, etc on Indonesian cultural music, arts, magick, ceremonial practices, etc. may be found in this section. This section is devoted to the exhibition of art-work in Indonesia depicting magickal and occult features. Here you will find documentation of our national and international activties.